Here is some interesting information from the research being carried out on obesity. increases the risk of mother to be obese (including other related health problems) in her later part of life; this happens when the pregnant mother gains more than the recommended weight. irrespective of child’s weight at birth. whether mother is slim or fat. The University of Auckland, New Zealand: International study finds new link between mother’s pregnancy diet and offspring’s chances of obesity. 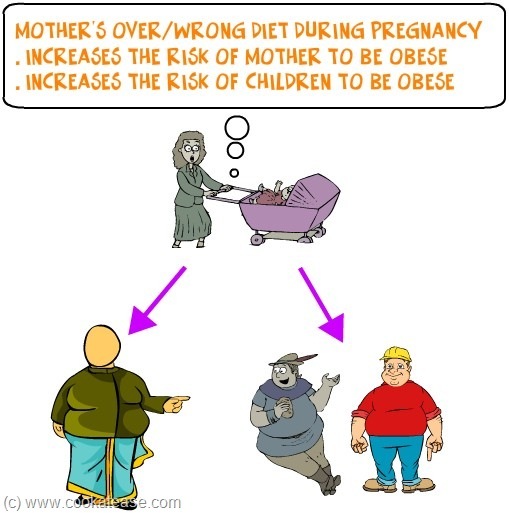 University of Bristol: High pregnancy weight gain can lead to long-term obesity.